The Society of Scribes and Illuminators is known internationally for its high standards of calligraphy. 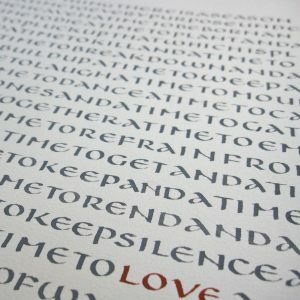 The Calligraphy Correspondence Course was originally part of the Roehampton University programme and its reputation grew steadily after it was launched in 1987, helping many calligraphers worldwide learn within a format both rigorous and flexible. The course was adopted in 2009 by the SSI, maintaining the same tutors and format. It is invaluable for those beginning to study calligraphy seriously as well as for those wishing to realise their full calligraphic potential. At the conclusion of the course, a completion certificate will be issued by the SSI. The full course is 24 lessons, which is divided into 4 units, each of 6 lessons. When we have received your payment for the first unit of lessons, we will send the printed copies of those lessons to you and you will be assigned to a tutor. As you complete each lesson you send your work to your tutor who will mark it and answer your questions. You can work at your own pace but as calligraphy is a skill that benefits from regular and sustained practice, we suggest that you complete a unit within a year. The tutors are Jane Addison, Tony Curtis, Yukiko Fukaya, Sylvie Gokulsing, Gillian Hazeldine, Vivien Lunniss and John Nash. 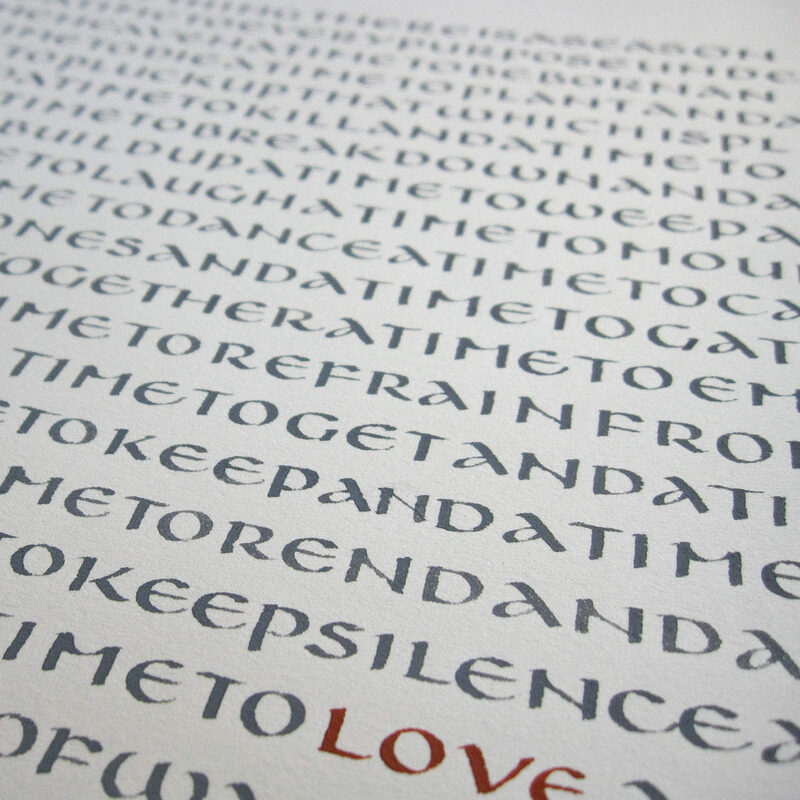 All are practising calligraphers with wide experience of teaching. The Calligraphy Correspondence Course was originally devised to answer requests from those who wished to study calligraphy seriously but were unable to attend full-time courses. Although the correspondence course has recently been completely revised and re-written, the areas of study remain the same. Detailed studies of classic letterforms and traditional penmanship are combined with projects to explore layout and design, manuscript studies, colour, simple manuscript books and panels. Please see below for a full course description. The Calligraphy Correspondence Course is open to anyone who is seriously interested in calligraphy; there are no entry requirements, no examinations and no assessment procedure. To enrol, simply follow this link to pay for a unit of the course. Payment can be made by credit/debit card or PayPal. Please note that units may not be transferred to another person. You must complete the Units in the correct order. Please do not buy Units 2, 3, or 4 until you’ve completed the previous unit. Lessons 1-6 give a complete study of Roman capitals. Studies include the geometric basis of skeleton capitals to illustrate relative proportions, freehand skeleton letters and spacing, layout and design using skeleton capitals, writing capitals with double pencils and with a broad-edged pen and designing with pen-made capitals. Lessons 7-12 cover the Foundational hand. Studies include skeleton and double pencil minuscule letters, moving on to pen-made minuscule letters and to writing the Foundational hand. The unit includes manuscript studies, an introduction to writing with colour, and the designing and writing of a double-page opening for a manuscript book. Lessons 13-18 continue the studies of the Foundational hand before moving on to study a classic formal Italic hand. The Foundational hand studies include working with smaller and larger nibs, considerations of interline spacing and of the importance of line length and legibility. The studies conclude with a project to design and write a panel using different sizes and weights of writing. The Italic studies begin with a manuscript analysis followed by writing skeleton letters and consideration of letter spacing. This leads on to double pencil letters, weighted pen-made letters and spacing, writing with larger and smaller nibs and the study of interline spacing and of combining different weights in a piece of work. Variations on Italic, including height/weight ratio, expansion, compression and slope, are then introduced. Lessons 19-24 continue the studies of the Italic hand. Further variations on the formal Italic forms include serifs, cursive and pointed Italic and experimenting with combinations of various forms. Studies of Italic capitals begin with skeleton and lightweight pen-made forms, leading on to weighted letters and their variations. Studies of informal Italic capitals lead on to the design of a more complex broadsheet balancing different weights and sizes of Italic capital and minuscule letters. I started on the SSI Calligraphy Correspondence Course with no background in graphic art, just a desire to learn. I soon discovered that producing beautiful writing doesn’t happen overnight and that as well as enthusiasm, a good deal of hard work and self-discipline is required. I found the course exceptionally well designed, with each lesson building on earlier ones. Only three scripts are taught, but having learned those in such detail, I now feel equipped to go about learning others on my own. The course also provides a solid grounding in layout and interpretation, which I don’t think I would have acquired elsewhere. I also liked the fact that each lesson finished with ‘work to be going on with’, giving a continuity between lessons. An essential factor in making progress was the feedback from my tutor, not just to highlight errors – this wouldn’t happen with a book – but for constant encouragement when frustration set in with my materials. I also had to learn patience with ruling up! Completing the course has been tremendously rewarding and given me a feeling of joy and competence when I pick up my pen. I couldn’t have had better instruction than the SSI Correspondence course. I would recommend the calligraphy correspondence course. I had always enjoyed doing some kind of calligraphy on my own but it was good to do a course starting completely from scratch and starting with the basics. It certainly made a big difference to me as it taught me to understand what I was doing and really look at the letter shapes properly. It was good to get substantial feedback after every lesson that I completed and I thoroughly enjoyed all the different aspects of the course. You do have to be quite disciplined and stick at it, several times I found it really hard working on my own but the support I got from my tutor was very good and I could email when I had questions about aspects of the lessons.